Recently, on a visit to Morrison Lane Cellar’s new tasting room in Walla Walla the winemaker made reference to the “Lost Bordeaux”. The Lost Bordeaux just happens to be the grape varietal Carmenere. 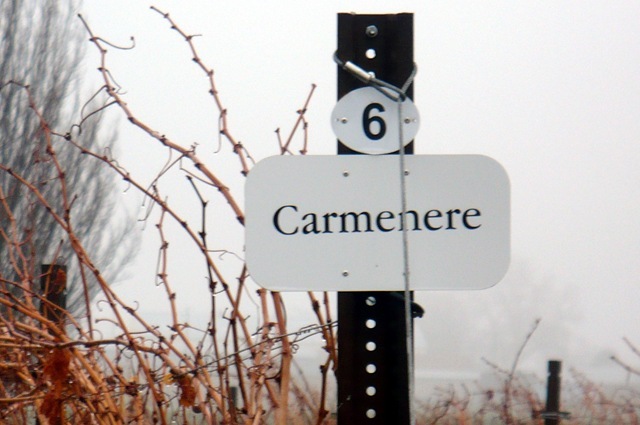 Carmenere is believed to have been one of 6 red wine grapes originally planted in Bordeaux, France. The other grapes include those that we have come to know and love as classic Bordeaux grapes Cabernet sauvignon, Cabernet franc, Merlot, Malbec and Petit verdot. Now only a few hundred acres of Carmenere can be found in the country of it’s origin having been forced into near extinction due to the ravages of a fungus called oidium and then in 1876 hit particularly hard by phylloxura. In fact so hard the French could not replant the Carmenere vine. Fortunately, Chileans liked French wines and modeled their vineyards after the Bordeaux region taking vine cuttings with them in the mid-1800’s. Some how back in Chile the Carmenere cuttings were mixed in and confused with the Merlot cuttings and Carmenere was mistaken as Merlot until 1998 when Chilean officials determined through DNA that Carmenere was not Merlot at all but that it was actually…the Lost Bordeaux. That is my version of the Carmenere lore but the real story about the Lost Bordeaux and Carmenere is that it grows really well in Washington. In fact, so well that there are a few wineries in Washington doing a straight Carmenere or blending magic with it.